Earthen pipes, also known as clay or stone ware, were usually made by potters and could be glazed or unglazed. They were used in Roman waterworks and also in some English works, such as Portsmouth in 1595. Earthen conduits were mentioned by Dr. Joseph Browne in a 1799 letter, and many companies produced them in the early Nineteenth Century. Terra cotta water pipes were used after the Civil War. Michael Freytag and John Curtis proposed to make earthenware pipes for the new Philadelphia water works in 1801, but "no one believed in them." Freytag and Curtis were potters in Philadelphia, see 1980 reference. A few water works systems used earthen pipes, but they were universally unsuccessful and replaced with other materials. Richfield Springs, NY 1879. Ten-inch earthenware pipe one-half mile long. 1805 Samuel Bartlett, patent #637X, October 1, 1805 for Pipes of clay, conduit, Hartford, Connecticut. Another patent #987X, January 5, 1809 for conduit, clay, Hartford, Connecticut. Sales agent for Connecticut (except Windsor County), - Nathaniel Seymour, West Hartford, 1807. Pipes may have been used in Farmington, Connecticut. 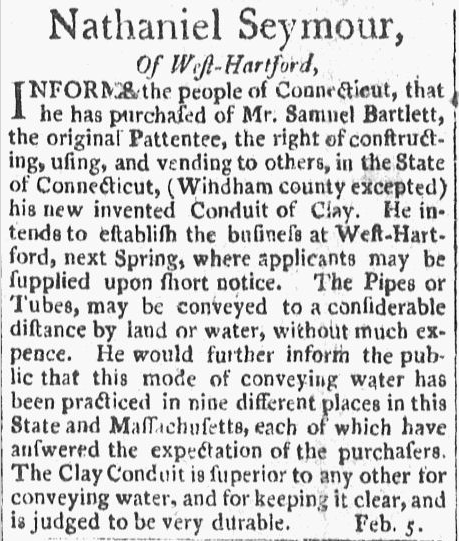 1806 "Conduit, Samuel Bartlett," Connecticut Courant, February 26, 1806, Page 2. 1806 Samuel Bakewell, 1806, no patent, widely advertised and used in Washington, D. C.
1808 Robert Ramsey, patent #893X, June 24, 1808 for pipes, conduit, mode of making from clay, Hanover, New Hampshire. 1807 "Nathaniel Seymour, of West-Hartford," American Mercury, February 19, 1807, Page 1. 1810 "Earthen Aqueducts," New-England Palladium (Boston, Massachusetts), January 9, 1810, Page 1. Mr. Robert Ramsay, of Hanover, N.H. has invented a machine, with which he moulds and presses clay pipes for Aqueducts. By the operation of this machine pipes are moulder, and pressed so hard, that when property burnt, they are nearly as solid and heavy as stone. The pipes are about eighteen inches in length, and can be made to any dimensions, necessary for common Aqueducts. They are made with such facility, that the cost does not exceed wooden pipes. Their strength and durability are incalculabe. If property burnt, they will last as long as stone. The water conveyed in these earthen pipes, will not be contaminated by them. This invention promises much. The pipes are joined something in the manner of wooden Aqueduct pipes, and fastened by a strong, cheap and durable cement. 1811 "James Rumsey's Patent Machine for making earthen Aqueduct Pipes," Hartford Courant, October 2, 1811, Page 3. The Subscribers Inform, that they are now provided with a handsome stock of EARTHEN PIPE For the conveyance of water underground. These pipes are connected with a a durable cement, and are capable of sustaining a considerable pressure. They have been proved in several different places, and are preferred by all who have tried them. It is presumed, that they will obtain a general preference, as their durability is greater than can be expected from bored logs; and the water passing through them is more pure. We might refer the public to a number of persons who have tried them, but we need that unnecessary. 1827 Joseph Putnam, Patent #4,640X, Mode of making pipes, tubes, etc., Salem, Massachusetts, January 17, 1827. 1828 Thomas Wickersham, making clay pipes, Patent #5,110X, Newbury, York County, Pennsylvania, May 13, 1828. 1851 "Stone Water Pipes," The Cincinnati Enquirer, November 19, 1851, Page 1. 1858 "Potteries," Sacramento Daily Union, January 1, 1858, Page 2. The Sacramento Pottery, (S.C. Bruce, proprietor) located near the Fort, has discontinued the manufacture, except as to earthen pipe, which is conducted with machinery. The pipe, which is of superior quality, and in demand for irrigation purposes, is constructed of all sizes, from 1¼ to 4 inch diameter, and with singular facility. The same machinery is capable of manufacturing the hollow or tubular brick, and has turned out a small lot for the San Francisco market. It is contemplated to erect a steam engine in the spring, and to conduct the manufacture with steam power on an extensive scale. This kind of pipe is now becoming known, and quite extensively used, to convey water under ground. So far as heard from, it has given perfect satisfaction, and been found to answer the purpose admirably. The cost of the pipe makes it the cheapest and best pipe used; and being made by machinery of the most perfect construction, it will make handsome joints and finished work. About one mile of this pipe has been used in Suisun City. It is also used extensively in Sacramento. About 1500 feet was purchased for Auburn. The Stockton Asylum use it extensively to convey water. Maj. Hensley, of San Jose, has engaged 4000 feet for water piping, and Judge Bliss, of Marysvillc, about 1500 feet. These are some instances of its use; and from the testimony received from various sources, the public can rest assured it is worthy their attention. We learn that the company who manufacture this pipe, and whose advertisement appears in our columns, will have samples, of various sizes, as well as their new fluted brick, on exhibition at the State Fair, and also at the Mechanics' Fair. A. K. Grim. Esq., of Sacramento, is the agent of the company, and will furnish every information requisite. 1860 Weekly Miners' Journal (Pottsville, Pennsylvania), April 21, 1860, Page 3. Terra-Cotta Pipe Agency! Stone Pipes, for conveying water to colleries or dwellings, and as discharge pipes for carrying water off. The subscribers have on hand, and are prepared to furnish stone pipes from 2 to 12 inches in diameter--with elbows and connections for connecting at any angle. 1860 "Home Industry - Southern Porcelain Company," Georgia Weekly Telegraph, October 4, 1860, Page 6. The company are also manufacturing porcelain water pipes, and have now contracts on hand for $50,000 worth of those, a large portion of which is for the water-works of the city of Augusta. Page 510: 1801. Michael Freytag and John Curtis proposed to make earthenware pipes, but no one believed in them. 1888 "The Use of Salt Glazed Vitrified Pipe in Water-Works Conduits," by Stephen E. Babcock, C.E., Proceedings of the Annual Conference of the American Water Works Association 9:29-46 (April 1888) Also includes information on wood stave conduits. Page 38: John Brelsford was a potter by 1846 and by 1849 he had established the "Northern Liberties Stone Ware Manufactory" at New Market and Germantown Road. 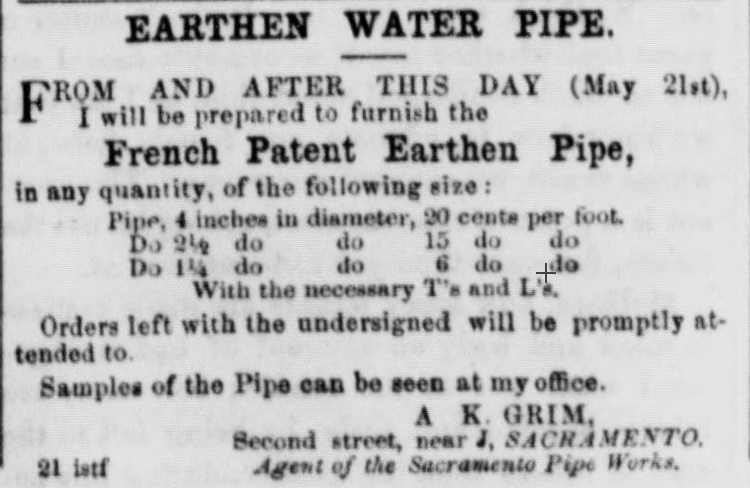 In 1853 he advertised that he made water pipes, chemical stoneware, and general household ware. Page 49: Note 31. South Fifth between Cedar and Shippen: Michael Freytag, by 1794-1807; Daniel Freytag, 1808-1824. Page 55: Brelsford, John 1846-1858. Potter at New Market and Germantown Road between 1846 and 1857. He may have operated his own pottery during all of this 12-year period although he listed himself only as "potter" until 1849 when he advertised his "Northern Liberties Stone Ware Manufactory . . . orders received at John Eckstein's, 36 n 3d st, Cornelius & Son, 176 Chesnut st." In the same year he listed the "Northern Earthenware Factory" but there is no indication that he continued to make earthenware. Brelsford is included in the 1850 census of manufactures (MC 3; see Appendix II). In 1853 the directory indicates that he was "manufr. of Chemical Apparatus, Stone Water Pipes, and Stoneware in general." (PD 63-65, 68-74, 76, 78-82, 84, 88.) Two examples of his household stoneware are illustrated in Figures 26 and 27. Page 57: Curtis, John 1797-1831? From 1797 through 1804 John Curtis, presumably the son of the above mentioned John Curtis, was a potter at 405 South Front Street. Apparently expanding the pottery, his address included 407 as well as 405 South Front between 1805 and 1822. He is listed at 405, 407, and/or 409 South Front Street as late as 1831 but is not listed as a potter after 1824. In 1810, Charles Dasher, an apprentice under Michael Freytag since 1805, was rebound to Daniel Freytag. By 1811 Daniel Freytag was making fine ware and was given special mention in the "Census" city directory. Earthen Ware Manufactory.—Cheap Iron Kettles. For Sale, Three large cast-iron Kettles or Boilers, generally used for boiling sugar in the West-Indies, and post askes, [sic] etc. in this country. Apply at the Earthen Ware Manufactory, in Fifth below South street. Page 105: Note 6. 6. For convenience of definition, ceramic bodies generally are divided into three major types—earthenware, stoneware, and porcelain—essentially determined by the composition of the clay, the porosity and density of the finished product, and the temperature to which each must be fired relative to the type of clay used and the end result desired. The first, earthenware, is fired to the lowest temperature, generally is porous, and consequently requires a glaze if it is to be watertight. It ranges in color between buff and red and can be made very light in color by the addition of a light-burning clay. Stoneware has a higher firing point than earthenware, is buff, grey, or brown in color, and requires no glaze to be watertight, though it usually is glazed for general utility and appearance. Stoneware is highly vitrified but not translucent as is porcelain. Porcelain has a vitrified and translucent body and usually is white in color. Authorities differ on the precise distinction in firing range between the three types but there is general agreement on the approximate figures of below 1200°C for earthenware, between 1200°C and 1400°C for stoneware, and roughly 1300°C and above for porcelain. Also see the general bibliography page, which includes links to several lists of waterworks with information about pipes.